Ahoy! After sailing the web we have adorable baby pirate bedding sets and decor for your little buccaneer's nursery room. These crib bedding sets present opportunities to decorate a pirate nursery theme in many color schemes and feature decorations that will inspire many DIY painting and woodworking projects. Their is a bountiful supply of pirate crib bedding sets that include large collections of wall decorations, crib mobiles and table lamps in addition to the expected crib quilt and fitted sheet. Whether you choose to use what is supplied or re-purpose items or make your own artwork is completely up to you. 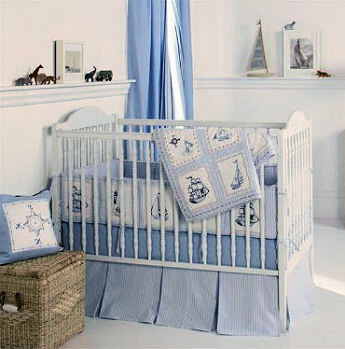 Base the design of your baby's room in a crib set made from fabric with a pattern of tall, sailing ships with their flags waving and pictures of pirates busily burying treasure on a tropical island in the middle of the ocean surrounded by palm trees. This beautiful crib bedding will launch your nursery decor towards a unique and adventurous journey with a fabric flag banner serving as a window valance flying in the breeze. Some baby pirates enjoy sailing the high seas with friendly jungle animals like a cute monkey, zebra or lion. You might buy a large, stuffed parrot to perch somewhere in the room. It will add lots of color and a feel of exotic authenticity to the space. No pirate worth his wooden leg would be caught dead without a parrot on his shoulder! Seriously! Many pirate bedding sets blur the lines between a pirate theme and other popular nursery designs. Manufacturers often include jungle animals and ocean creatures and other pals to add a little lighthearted fun. 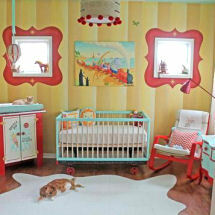 For those who prefer that the crib set make a more dramatic statement; there are sets that fly the Jolly Roger flag. Flags flying the grinning skull known as the Jolly Roger may be too dark or gothic for many but many feel that no pirate theme room should be without one. Once you have the best pirate bedding for the nursery of your dreams, it's time to decorate the rest of the room. Consider decorating the walls with a painted pirate mural or one that you design with pirate wall stickers or decals and a pirate hat. A pirate treasure map rug is also a good idea since it will add to the decor as well as provide a soft place where your baby can play. Finding crib bedding, sheets and other decorations for a baby boy was no problem but finding a collection for a baby girl pirate took some little digging in the old treasure chest. Transforming a style that is traditionally used for a boy into one suitable for a baby girl often takes little more than a few touches of pink. Decorating this room requires a lot of stuff to either make or buy yourself so why not add some of the items to your pirate baby shower gift registry and let your friends and family join in the fun? Please make plans to visit Unique Baby Gear Ideas again soon to see the latest pirate baby bedding sets and nursery decorating ideas.